"We showed for the first time that breast-specific microbiome populations are significantly affected by diet, and this was in a well-established nonhuman primate model of women's health, increasing the likelihood that these findings will be important for human health," says first author Carol Shively of the Wake Forest School of Medicine. "The breast microbiome is now a target for intervention to protect women from breast cancer." "However, it was unknown what possible factors could modulate the breast tissue microbiome," says senior study author Katherine Cook of the Wake Forest School of Medicine. 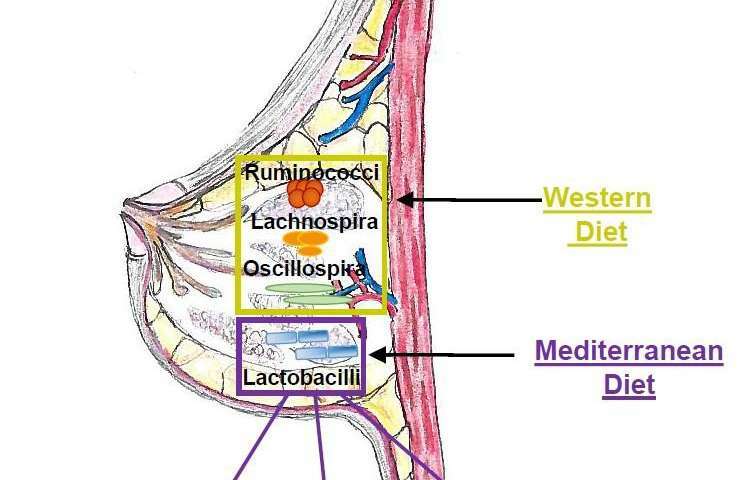 "Diet is a strong influencer on the gut microbiome, so we decided to test the hypothesis that diet can impact mammary gland microbiota populations." To address this question, Shively and Cook used macaque monkeys because the animals mimic human breast biology and have been used to study breast cancer risk. One advantage over human studies is that the food intake of the monkeys can be carefully controlled for a prolonged period of time, increasing the chance of observing profound effects of diet. The researchers assigned 40 adult female monkeys to receive either a Western or a Mediterranean diet for 31 months. The breast tissue of monkeys that consumed a Mediterranean diet had a 10-fold higher abundance of Lactobacillus, which is commonly used in probiotics and has been shown to decrease tumor growth in animals with breast cancer. The Mediterranean diet also increased levels of bile acid metabolites and bacterial-processed bioactive compounds that may decrease breast cancer risk. Moving forward, the Cook lab plans to investigate the physiological impact of increased Lactobacillus in mammary gland tissue. They will also assess whether oral interventions such as fish oil or probiotic supplements can impact microbial populations in mammary glands and breast tumors. In addition, they are exploring the role of bacterial-modified bioactive compounds and bile acids on inflammation, breast cancer tumor growth, and therapeutic responsiveness. "Our future studies are designed to validate the use of probiotics, fish oil, or antibiotics during neoadjuvant therapy to improve therapeutic outcomes," Cook says. "We hope to translate our studies into the clinic in the near future."